Hello, again! I am on a roll lately!! 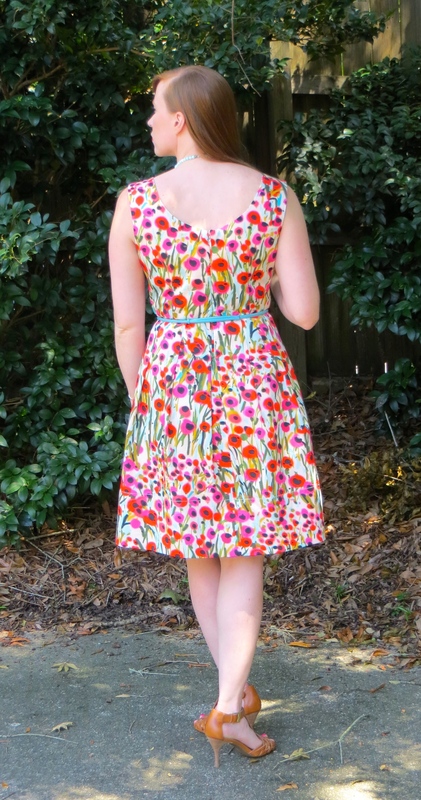 I’m back today to share with you my completed Vogue 1353, a great pleated fit-and-flare dress with a full lining by Kay Unger. I was inspired by Margo’s recent review of this pattern (isn’t she gorgeous?!? ), and bought it next time Hancock’s had a sale and started sewing almost immediately. 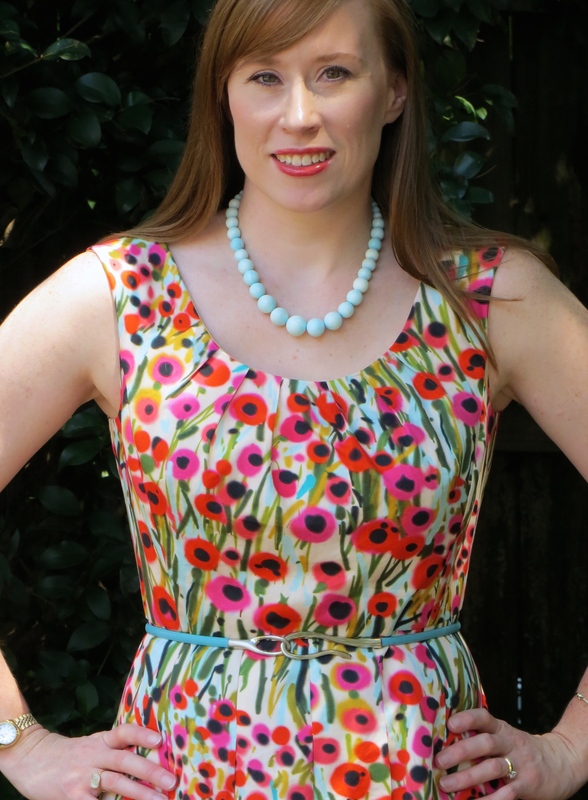 I made this beauty up in a great poppy print stretch cotton sateen from Sawyer Brook Fabrics. 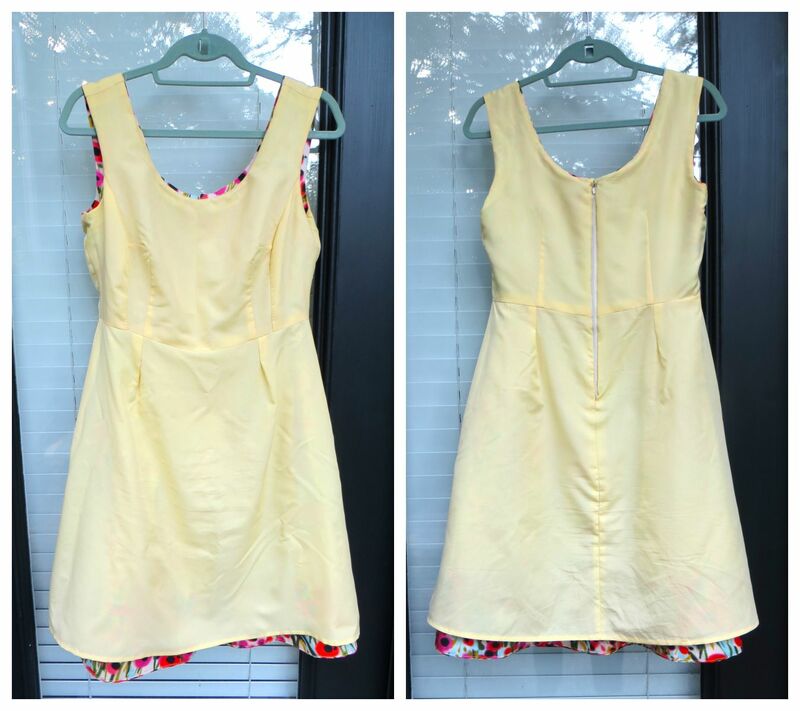 I lined it with a creamy yellow polyester pongee from Fabric Mart Fabrics that I think I paid $1/yd for… Cotton sateen is a dream to sew with after you’ve been doing nothing but knits and silks. It actually does what you ask it to! My favorite part of the dress is the hem with its facing and topstitching. I used the chainstitch function on my Juki MO-735 5-thread serger to create the textured line of stitching instead of the handstitching that is prescribed in the pattern instructions. I stitched with the hem facing up so the “wrong” side of the stitching shows on the outside of the dress, creating a nice, visible line of thread. I love finding new uses for my serger! The pattern calls for a purchased belt and here I’ve accessorized it with a cute little aqua leather belt with a silver buckle that I picked up at Gus Mayer department store in Birmingham. I think this is probably the only thing (at $38) that I could ever afford from that store but I do love it! I have also paired the dress with a bead necklace from Kluster Shop and some Franco Sarto strappy heel sandals. This is my new favorite dress pattern and I think there will be another one soon. Stay tuned! Here we are again, on the eve of another work week, and I have another productive sewing session to tell you about. I have completed a Vogue 1353 which turned out great and I will share once I get photos. I have also made another Closet Case Files Sallie Jumpsuit trying to perfect the fit. And I made another McCall’s 7121 that just needs a hem. 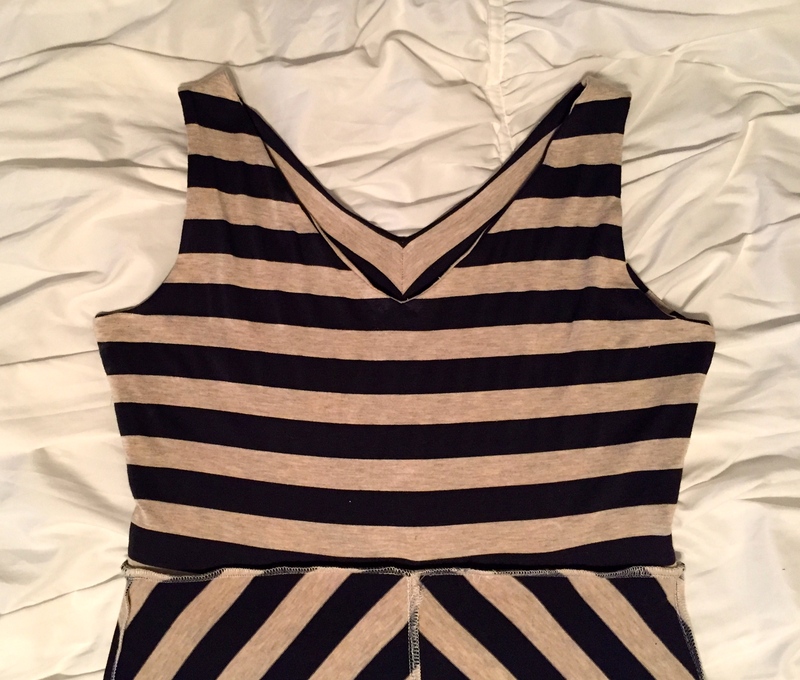 Spoiler alert — no crazy stripe matching in this version. 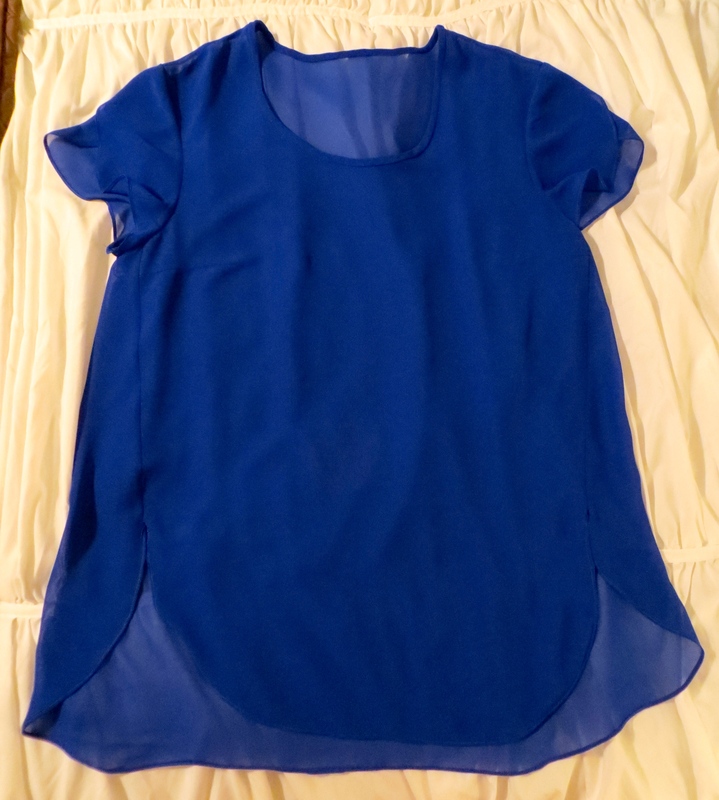 But what I am going to share with you today is this sheer, swingy blue blouse made up with the hot-off-the-presses In-House Patterns Chelsea Blouse. It’s no secret that I love Alexandra Morgan’s skills as a designer, pattern drafter, and conveyor of streamlined and industry-style sewing techniques. You can see some of my previous In-House makes here and here (I think there is going to be another Belle Blouse in my future soon). There are others that have never made it onto the blog (my sister loves the Jenny Tee that I made and gifted to her). This top is trendy but basic enough that you could make it up in a crazy fabric to wear now or in a nice neutral solid to keep in your wardrobe for many years. The pattern also provides the option for color blocking or mixed media (think lace or chiffon back panel). 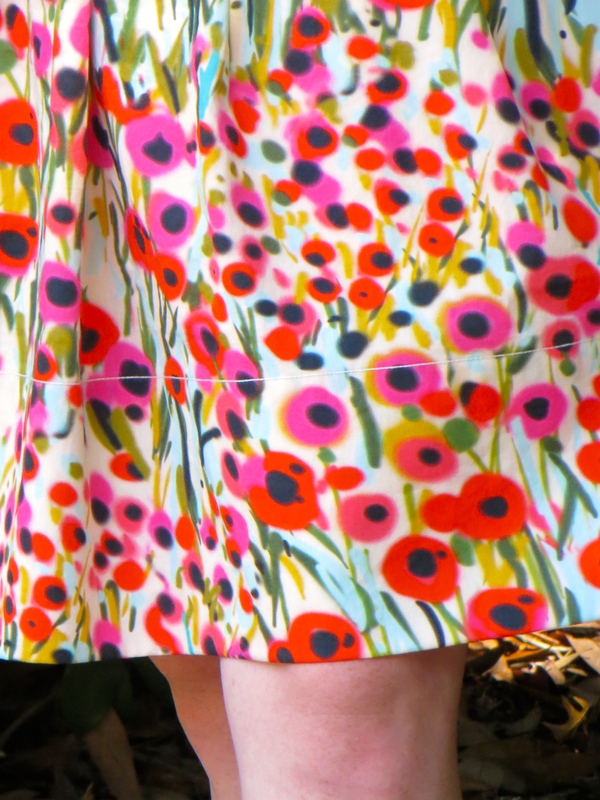 I love the way the side seams swing forward toward the front as they head down to the hemline. I think this makes the silhouette more slimming. What do you think? 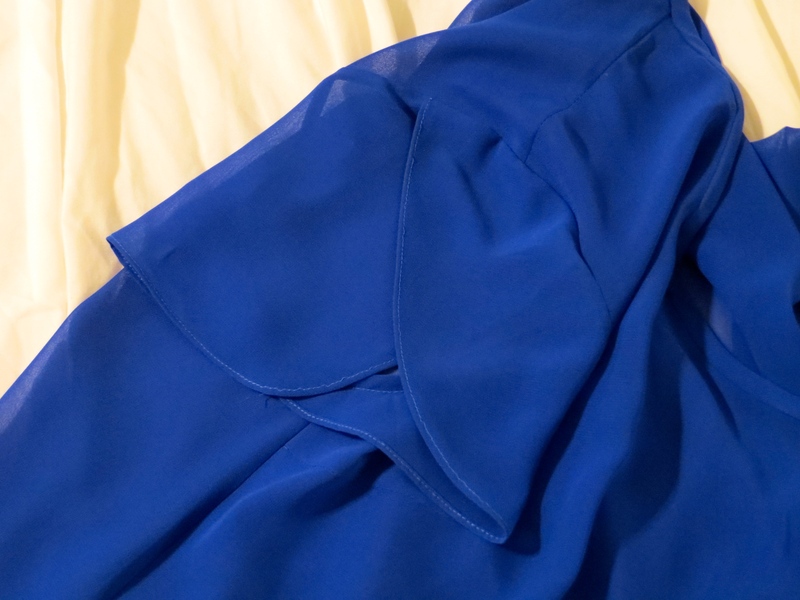 I chose to make mine up in a royal blue polyester georgette by J. Crew ($3.50/yard), one of a few pieces in a recent Fabric Mart Fabrics acquisition. 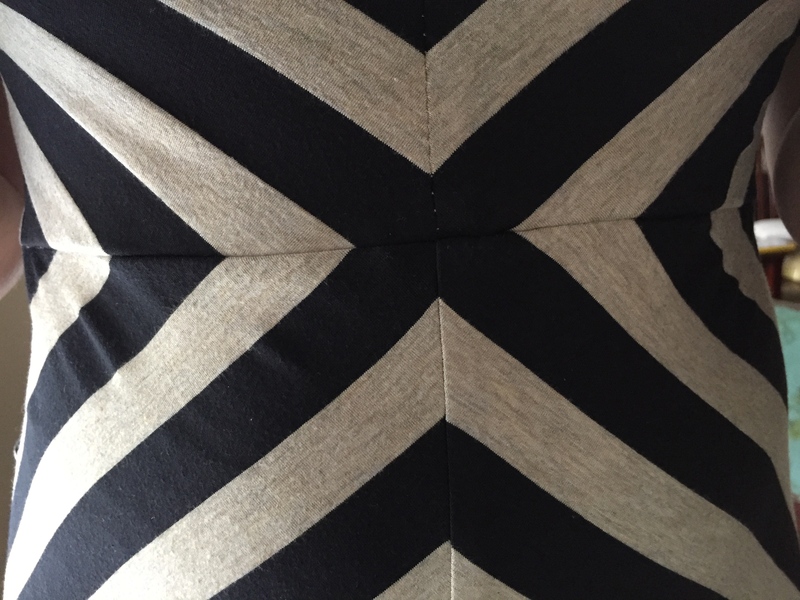 While this wasn’t the easiest fabric to work with, by taking my time getting the fabric on grain, cutting it out with a rotary cutter, and carefully pinning and stitching, I think I was able to achieve a satisfactory garment. Now, don’t get me wrong, this isn’t my best work ever. My rolled hem foot gave me fits and my neck binding refused to be stitched in the ditch so I had to resort to handstitching it. But the casual observer will never notice these things. For sizing I chose a large with D cup and I added 5/8″ width to each shoulder as well as making a 1/2″ forward shoulder adjustment. I chose these adjustments based on the fit of my Blossom Blouse but I feel like the width I added to the shoulders was unnecessary and makes me look even broader than I am. Based on prior experience, In-House Patterns are drafted with very little ease so I don’t try to fudge on choosing my size. But I think in this pattern I could have gone with the medium. As far as construction goes, I used French seams for everything, including the armscyes. As mentioned above, the French binding on the neckline was stitched down by hand with a fell stitch. The body and sleeves of the blouse are hemmed with the rolled hem foot on your machine. From prior experience, I knew this would be tricky but I forged ahead. I had to adjust my needle position to get the stitching to hit in the right spot. And some places aren’t rolled right but it’s not obvious from the outside. It got a little easier as I went along, though, and the sleeves aren’t too bad. 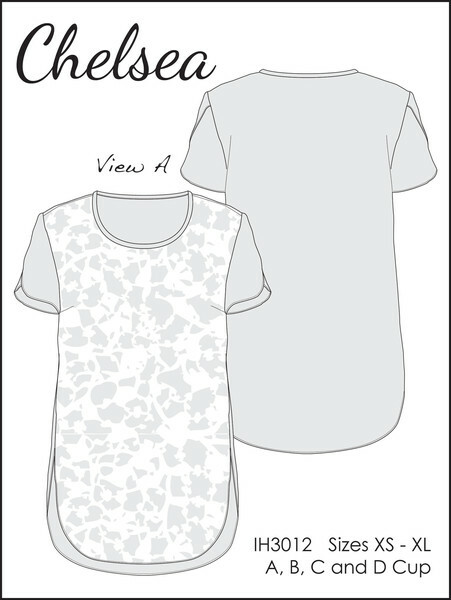 The Chelsea Blouse from In-House patterns is another solidly drafted pattern by Alexandra Morgan. I would love to see your version if you decide to sew it up! Happy Sunday, friends! I am so excited to share this most recent finished object with you today! Let the record show that this is my first official presentation of a completed, truly wearable, hand-knitted garment!! The pattern is the Aures Lace Yoke Tee by Rhiannon Owens and I knitted it up in some gorgeous azalea-colored silk-tencel blend yarn that I picked up at my local yarn shop (Zitron Glanz Punkt in color 8028). The finished product is not perfect but it is close enough for me to be happy to wear this tee out of the house proudly. It fits well thanks to the thoughtful sizing of the pattern designed for hourglass shapes and the color goes with several things already in my wardrobe (Gabriola maxi case-in-point). Win-win! The construction is nice because it is knit all in one piece from the bottom up, even the little cap sleeves are knit in unison with the body of the sweater. I was able to try it on as I went to make sure the circumference of the hip was going to be adequate. I included the short row bust dart for a D cup (my first time to do this in a knitting pattern), but I think it may have provided a little bit too much length in the front. I used the Icelandic bind off for the neckline as I read it was supposed to be a stretchy bind off for garter stitch but I don’t find it to stretch very well. My critiques of the pattern are few and minor and may result from my relative inexperience with knitting. First, I would prefer to have the pattern designer include what she considers A, B, C, D, and DD cup sizes. Sometimes cup sizes for patterns are different than bra sizes and bra sizes can vary depending on which country you buy your bra from… I would also like to see a diagram with finished garment measurements like many other patterns include. Finally, because I am super OCD, I would like to have stitch counts included for the final row when you begin the neckline binding to make sure I have done all my decreases correctly. I know I could do the math myself but having the designer include it is an extra safety measure. Overall I am tickled pink with my new sweater and can’t wait to get started on my next knitting project. What have you been crafting? 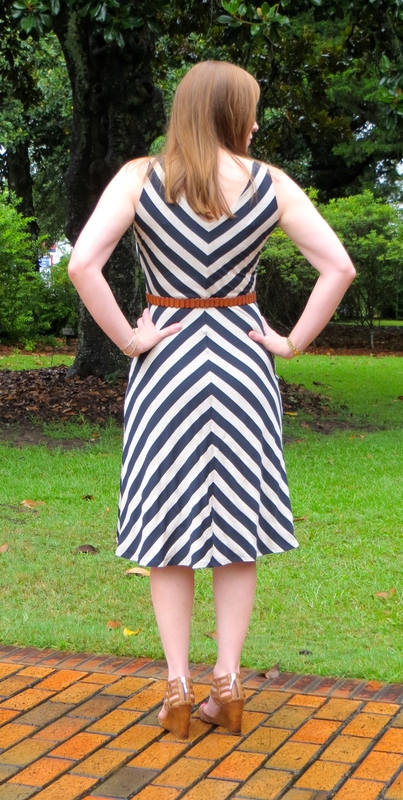 McCall’s 7121 | Stripe Matching Victory! Happy Sunday, friends! I hope you are all rested and ready for the week ahead. I have taken advantage of this long holiday weekend to catch up on my never-ending list of things I would like to sew. 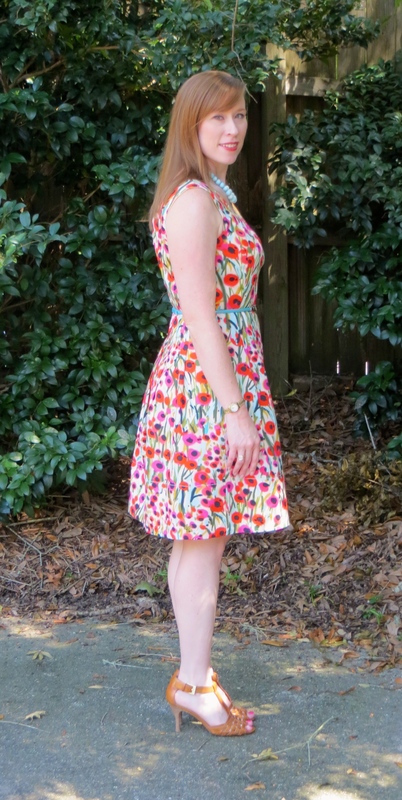 I have made a simple knit sheath dress from some floral print scuba knit, a psychedelic Closet Case Files Sallie Jumpsuit, a Watson bra, started on the Maison Fleur Halterneck Swimsuit, and just finished this cute little dress — McCall’s 7121. Hopefully I will get around to sharing those other things with you but if I don’t, at least you know I’m back to sewing! And now that my knit fest is over, I have plans to start on some woven items like a dress and some blouses. I will keep you posted. Y’all know I love a good knit dress. Exhibits 1 and 2. And there are more that I haven’t even shown you but that make regular appearances in my wardrobe. So it’s not a surprise that I picked up this pattern when they went on sale for $1 at Hancock’s. But I think I love this one a little more because it has a waist seam and the skirt is a little more A-line. And since the front bodice is not cut on the fold, McCall’s added a little bit of bust shaping there in the front for you. And the stripes make it so fun and flattering. Plus, I get to show off my stripe matching skills! What, you thought I was hiding something under the belt? BAM! I chose my size based on the finished measurements, not the size chart, and I selected sizes that would yield zero to a little negative ease in the bust and waist. I made my standard adjustments of 1/2″ forward shoulder and 1″ swayback and I also decided to raise the neckline by 1.5″. After I stitched this up, I realized the armholes and back neckline were gaping and the waist was a little low so I pinched up the shoulder by 1.5″ and stitched a new shoulder seam, effectively fixing all three problems. I think using neck and armhole bindings would prevent the gaping but this pattern just calls for turning and stitching. Which, of course, I didn’t do! I decided to self-line the bodice for a clean finish at the neck and armscye. 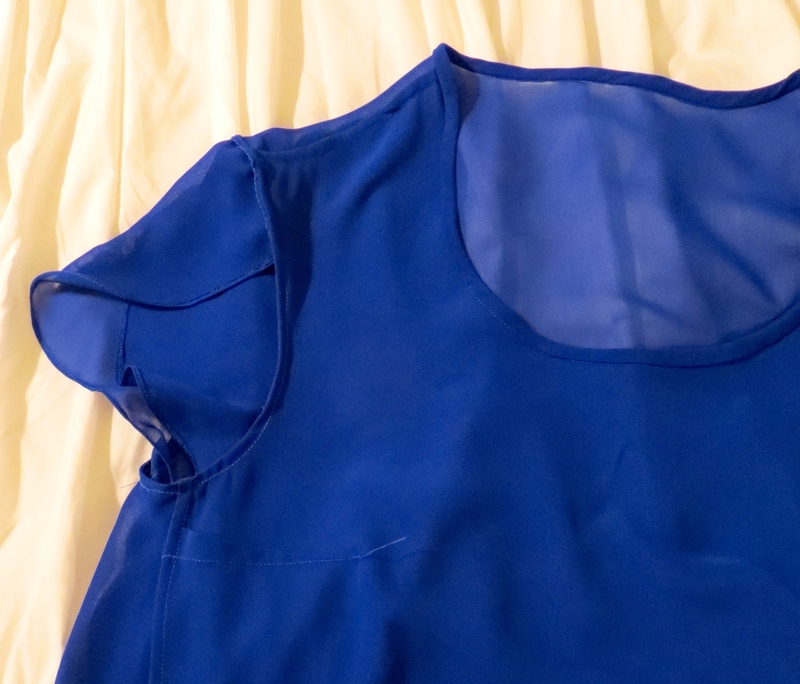 I did sew some clear elastic into the neckline and after I raised the shoulder seams, it lies smoothly. Finally, I serged some clear elastic into the waist seam and hemmed with a twin needle.